We live in an age undreamt, where information pours forth like rivers into oceans. We need people to help us find the information we need. We need librarians. Kyle Cassidy wants to make sure the world knows this. Cassidy, a photographer and something of an anthropologist of modern sub-cultures, shot photos and conducted interviews with librarians at the American Librarian Association’s annual convention. He wants to take that idea much farther though. His goal is to document at least 100 librarians, make a short documentary film, and create a traveling gallery that can showcase the importance of librarians’ work, all while dispelling our deeply ingrained stereotypes about librarians themselves. 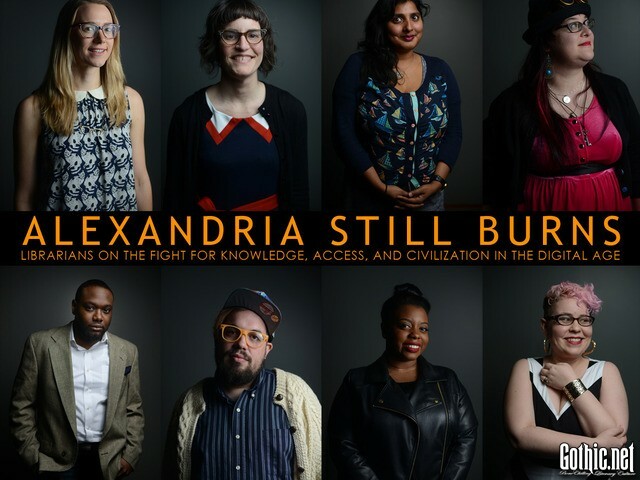 The project, called Alexandria Still Burns: Librarians and the Fight for Knowledge, is being funded by a Kickstarter, which has already hit its goal and is pushing toward interesting stretch goals. There are a variety of backer levels if you’d like to support this project. The $40 level, which gets you a poster showcasing a bunch of librarians, would look great on any library wall. I fondly recall those days when I was 10 or 12 or however old I was back then, leaving the library with a teetering stack of books. I mean, truly ridiculous amounts of books. I’d spend the entire evening reading, and I know for sure there were some great librarians who helped young me find all the weird stuff I was into back then, which helped me become the weird person I am today. Thanks librarians! Photograph & interview 100 librarians to make a touring gallery show & help tell the story of why and how libraries are important. $7,500 New Stretch Goal: Stock photos that libraries can use. I’d love the opportunity to get some librarian models and take a bunch of useful images and then release them into the wild under a creative commons license so that libraries (and book lovers) could use them, royalty free, in creating web pages, brochures, and signs about books. This gets unlocked at $7,500. Librarians: do you have requests of what would be useful to you? Let me know. $6,000 New Stretch Goal: Documentary Video! – Goal Met! If we can get to $6,000 I can afford to bring a videographer with me and shoot a short documentary about why libraries are important. I think this will go a long way to getting the message out to people and get them thinking about why libraries matter. Backer update coming soon. In February of 2014 did a photo essay called “This is what a librarian looks like” which was published by Slate Magazine and instantly went viral, rapidly becoming the most popular photo essay they’d ever run. That project consisted of thirty portraits and interviews with librarians on the challenges they faced and the role libraries play in a world where many people have reliable Internet connections and amazon prime accounts. I realize that the story is incomplete and I want to go to the ALA’s big conference this summer in Las Vegas and try and do at least a hundred portraits and interviews to get a bigger, broader, picture (so to speak) of what libraries and librarians are doing today. Ultimately I’d like to see this come out as a book, but more immediately I want to create a touring gallery show that can be easily hung and shipped for libraries, galleries, coffee shops and offices and make it available for libraries to show, for free, to help tell the story. Because ultimately this isn’t really at all about what a librarians looks like, it’s about knowledge, access, and civilization. Posted by Ed Grabianowski on Wednesday, June 18th, 2014. Filed under Books, Headline, Lifestyle, Professional. You can follow any responses to this entry through the RSS 2.0. You can skip to the end and leave a response. Pinging is currently not allowed.